Matt is Head of Ecommerce for Lovehoney – The Sexual Happiness People, and as such, there is very little he gets embarrassed about. He was first introduced to perfume with a present of Valentino’s Vendetta on his 15th Birthday, and fondly misses Gucci Rush for Men, although he probably remembers it being much better than it actually was. He currently has a thing for tobacco-influenced scents, and is deciding whether heating, or Amouage’s Jubilation XXV is more important this winter. A fresh, dry, lime based vetiver scent, Boisee is ideal for the work place or the hotter months. The opening has a lot of lime (rind) in there which lasts a reasonable length of time (given its a citrus note). Alongside this is an earthy vetiver, not unlike that same note found in Gurlain vetiver but nowhere near as strong. Drydown occurs reasonably early with light dry wood notes creeping in after which the scent doesn't really change. This is not a bad thing as the scent is very nice and for a lighter frag actually lasts a reasonable length of time (5-6 hours). Other scents that do much the same thing, though smell different, are Terre d'Hermes and Mark Jacobs Bang, Comme des Garcons Man 2 (though Man 2 is much more rich a frag, the times one would wear it are the same as that for Boisee). 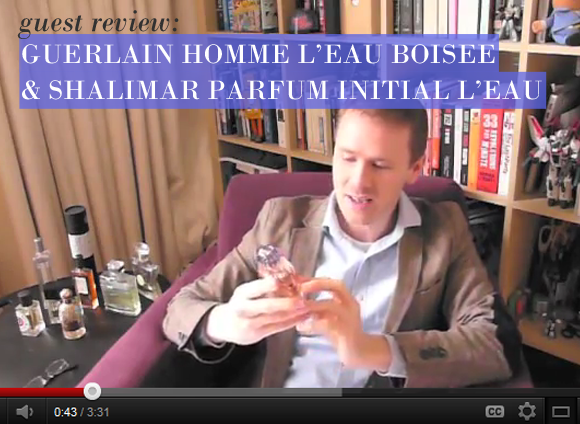 This entry was posted on Wednesday, February 8th, 2012 at 9:25 am and is filed under Fragrance, Guest bloggers, Tried & Tested, Video. You can follow any responses to this entry through the RSS 2.0 feed. You can skip to the end and leave a response. Pinging is currently not allowed.